Irish music is experiencing a good revival of popularity in the US. For about 15 years, independent record labels on this side of the Atlantic have been releasing a healthy number of recordings by some of the outstanding traditional musicians from the Chieftains to a younger generation of performers. Then a few years back, Enya, the former lead singer with the group Clannad started dabbling with synthesizers and multiple overdubs in the studio. Someone at an ad agency took a liking to the recording and it became the backdrop for a car commercial, and launched another commercially popular Irish music offshoot: a kind of Celtic-flavored new age sound, which reminds me of a Muzak system in a yuppie boutique selling ersatz Celtic folk art. A further wave of interest in Irish music, this time a bit more authentic, came with the popularity of the Riverdance folk-dance touring stage production, which featured music performed by some of the outstanding young traditional players such as Seamus Eagen and Eileen Ivers. Yet another facet of the Irish connection is represented in this week's album. It's by an Irish musician who moved to New York and absorbed a lot of the American folk and even a little alternative rock, but still maintains roots in Irish folk music. 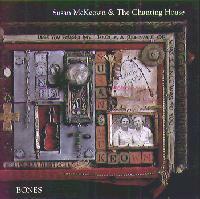 Its by Susan McKeown and Chanting House and the CD, actually her third or fourth record, is called Bones. There are other Irish musicians who have followed similar roads to the US in recent years, such as Luka Bloom and Pat Kilbride. The former developed a distinctive style with relatively little in common with traditional Irish, while the latter maintains stronger ties with the tradition. Ms. McKeown is an interesting hybrid -- her songs have much in common with the new generation of American singer-songwriters like Patty Larkin or perhaps Mary Chapin Carpenter -- while she or her record company describes her style as acoustic rock. There is often a rock drive to the music, even at times bordering on punkiness, while many of the tunes have an underlying 6/8 jig meter. Ms. McKeown herself doesn't outwardly sound as you would expect from an Irish singer, but that influence does creep in from time to time, especially when she breaks out into the Irish language in some of the tunes. She also has an excellent sense of dynamics, able to put a lot into her songs. A native of Dublin, Ms. McKeown comes from a musical family, but as a teenager she decided that after some formal voice training, she would instead go out busking songs on the street. She came to New York in 1986 as an arts student, then returned to the City in 1990 to study performance on an Irish scholarship. Working as a waitress to support herself she eventually took to performing, whereupon she began to gain attention. After a year, she again dropped out of the formal music education in favor of performing, and was soon sharing New York club stages with the likes of other Irishmen Sinead O'Connor and Bob Geldof. She originally formed her band Chanting House in Dublin, and its early incarnation included such luminaries as Eileen Ivers and Seamus Egan. She began to attract wider recognition through a series of independent cassette releases that won considerable praise on both sides of the Atlantic. In the meantime, her style was gradually moving away from being based as heavily on the Irish influence to being centered around her songs, whose stylistic ingredients are wide-ranging. The current Chanting House lineup includes Chris Cunningham, who plays mainly guitar, cellist Michelle Kinney, acoustic bassist Lindsey Horner, and percussionist Joe Trump. There are some guests including traditional Irish musicians Johnny Cunningham and Jerry O'Sullivan. The album's producer is a fellow named Jimi Zhivago, who also played some keyboards. This album Bones has actually been around for a while. It was independently released in 1995, and got national distribution in the US last fall, but it continues to gain notice. It's a fascinating and difficult-to-describe blend that is often pleasantly surprising in its juxtapositions. Bones the recent album by Irish-born, New York-based singer-songwriter Susan McKeown and her group Chanting House is a fascinating stylistic blend that combines some influences from the artists old country with plenty of the musical environs of her adopted hometown. She is a literate songwriter who draws on both traditional and contemporary imagery. As a vocalist she has a wide expressive range and a wonderfully clear quality. Chanting House, with its primarily acoustic instrumentation emphasizing the prominent cello, combined with frequently rock-influenced rhythmic drive, further adds to the distinctive sound of the album. The result is a record more likely to be compared to The Pretenders and Suzanne Vega than to the Chieftains. Sonically, the album makes for satisfying listening on a good sound system. The acoustic instruments are well recorded, the mix keeps things is proportion, and electronic effects are reserved for times when they provide a specific effect, rather than being used for their own sake. There is some compression, but the dynamic range is still respectable for a pop album. The production and eclectic arrangements are one of the album's greatest strengths. Irish music is definitely making inroads in America. Susan McKeown and Chanting House create a highly original and appealing composite of ingredients from both countries.